When you view a cluster in Google News, there's a new option to filter sources: you can restrict news articles to blogs and to local news sites that are relevant to your query. The filters are a good way to find opinionated articles and more up-to-date information from local sites. Here's an example of cluster that groups articles about some new information regarding last week's Qantas Airways flight that was forced to make an emergency landing in Manila. 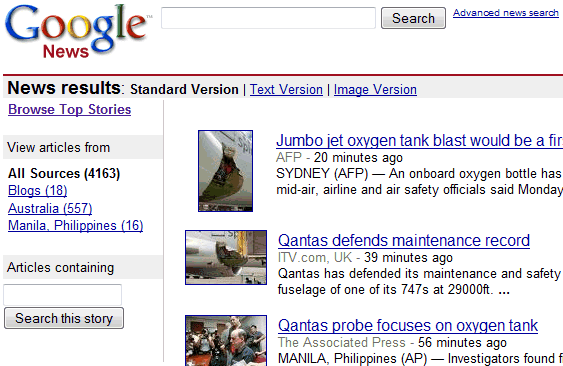 Google shows three filters: blogs, Australia (Qantas is the national airline of Australia) and Manila, Philippines. There's also a search box that is supposed to let you find articles from the cluster, but it doesn't work properly right now. But what I miss the most is the ability to search the news in any language. When we search the web, blogs, videos, ... we can search for a keyword, with results in all languages, while with Google News we can't, we are limited to one language at a time. I speak various languages (I live in Belgium where there are 3 official languages) and it would be helpful if I was not limited to one language in Google News searches. It is possible to do it on Yahoo! News Search, why not on Google News (search)? why not stop descriminating against blogs altogether already? I've just discovered www.jamesoo.com thanks to kilerstartups and I think it's a good alternative to google news. Plus, it has a newspaper look which is original for a news search engine.